Nick the Statue of Liberty, Stone Henge and more. 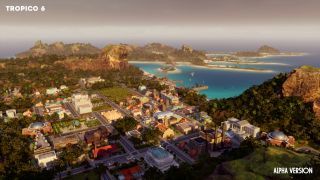 In Tropico 6, El Presidente has taken a shine to the famous monuments of France, the United States, the UK and more, and he'd quite like to have them for himself. Now, you might think that pilfering world monuments is a ludicrous idea, but if so, you've never been to the British Museum. In this latest entry in the strategy series, you'll go about these daring quests by forming societies of avaricious scoundrels, from pirates to more modern, sneakier spies. As a representative of El Presidente explains in this snippet from a panel at the recent PC Gamer Weekender, there will be four eras of thieving agents, to match the four eras of the game. You'll be able to form a pirate cove in ancient times, or a spy academy in the modern era, before sending your operatives out on heists to steal, among other things, enormous structures such as the Eiffel Tower, Stone Henge, or the Statue of Liberty. Quite how your agents will lug them back is anyone's guess, but developer Limbic Entertainment's 'out' is that the series has never taken itself entirely seriously. Releasing sometime this year, Tropico 6 has a few more notable bullet-point features, including new transportation and infrastructure elements such as tunnels and bridges. You'll also be in control of an entire archipelago rather than a single island this time, giving you bigger maps to wrestle with throughout the game.